Thanksgiving guests love this traditional sweet pumpkin pie filling combined with the unconventional salty crunch of the pecan pretzel crust. Traditions are a big deal in my family. They attend every celebration from birthdays to Christmas to summer holidays and New Years’ Eve, and they cannot be forgotten. Some are normal like the birthday person choosing their favourite restaurant for dinner; some, like going to a new film at the cinema on New Years’ Eve, reflect parents who love celebrating special occasions with their children. Many of the traditions I grew up with I hope to continue forward with my own family in the future. One of those being the Thanksgiving pumpkin pie. To really paint an accurate picture of how important the pumpkin pie is to my family’s Thanksgiving spread, I need to tell you a short story. 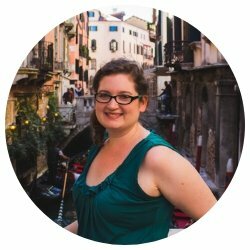 A few weeks shy of my sixteenth birthday, my family agreed that my aunt would host Thanksgiving dinner. It would be a large gathering. My immediate family, my uncle and his, and my grandparents would all be in attendance; eleven stomachs to feed in all. About a week before the event, my mom offered to bring the pumpkin pie or anything else that would be helpful. “No, I have everything handled,” my aunt replied and requested we only bring our wonderful selves to dinner. My brother and I exchanged looks of horror, but not wanting to be rude, we accepted our dessert silently. It wasn’t until my uncle received his plate of pie and expressed his confusion over the selection that my brother and I finally voiced our concerns: “It’s not Thanksgiving without pumpkin pie!” We all raised such a fuss that my aunt now fondly recalls the incident every Thanksgiving. 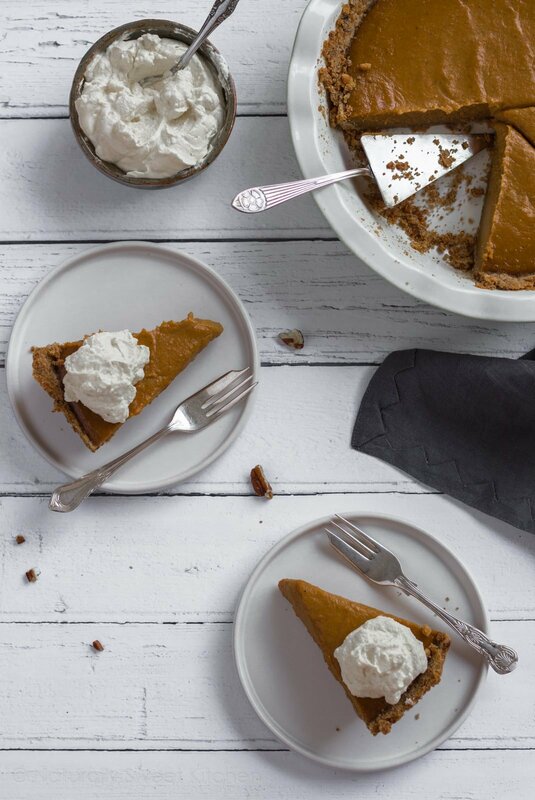 This pumpkin pie recipe brings together my love of family tradition and of experimenting with unique flavours and textures. It’s an oldie, but a goodie. I originally published this recipe on The Cinnamon Scrolls in 2015, and it was one of my most shared, viewed, and asked-for recipes. 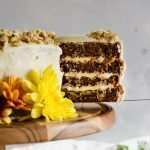 I had to update and recreate it for Naturally Sweet Kitchen. This is an easy, no mixer required recipe, so it’s the perfect dessert to make with the whole family. Let the little ones whisk together the pumpkin custard filling or smash the pretzels and pecans into dust. You can also make the two components of this pumpkin pie a day in advance, making it easy to throw together and pop into the oven on Thanksgiving Day. Not to mention the smell of it baking will make all your guests drool in anticipation. 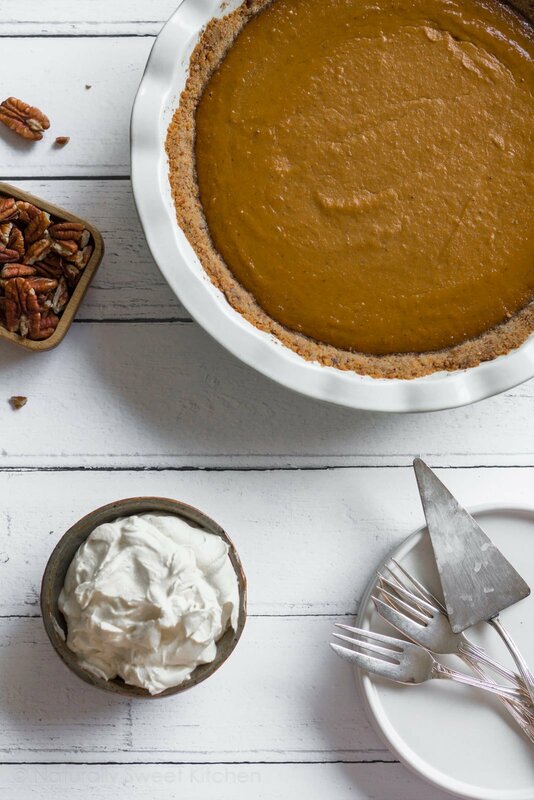 It’s hard for me to choose a favourite part of this pumpkin pie recipe. 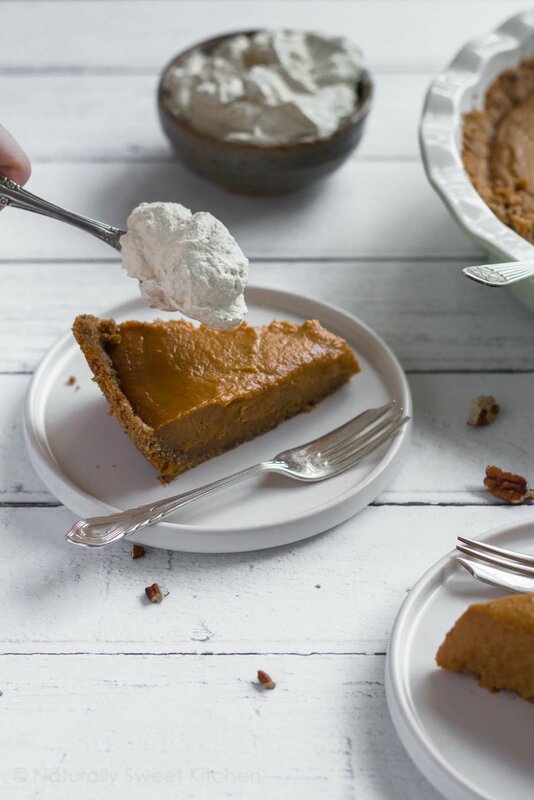 The warming spices and sweet maple syrup in the pumpkin custard remind me of my childhood Thanksgivings back home, surrounded by family and recollections of past gatherings. 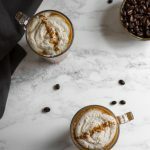 But the pecan pretzel crust echoes my own life and my travels abroad – I first tried a pretzel crust during my year in Australia, and I’ve been addicted to its salty crunch ever since. In combining the two I created my own traditional pumpkin pie recipe that represents my life up to this point. 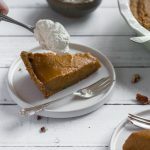 Whether you’re a traditionalist or not, I hope you’ll enjoy a warm slice of this refined sugar free pumpkin pie with a dollop of whipped cream and a hot cup of tea this Thanksgiving. That’s how it’s done in my family after all. 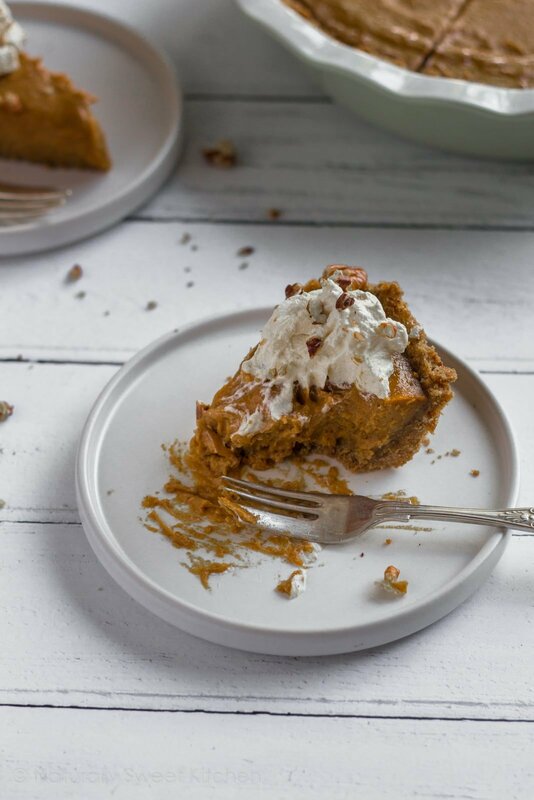 Your guests will love the traditional sweet filling of this pumpkin pie combined with the unconventional salty crunch of the pecan pretzel crust. 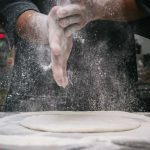 Preheat the oven to 160°C (325°F) and lightly grease a 9-inch pie dish with butter. Whisk together the pretzels, pecans, flour, and sugar until well combined. Pour in the melted butter and stir until well coated. The mixture should look like a sandy crumb and hold together when you squeeze it. Tip the mix into the prepared pie dish and firmly press it into the bottom and up the sides of the dish. Gently place a sheet of baking paper or foil over the crust and weigh it down with either baking beads or rice. Parbake the crust for 12 minutes, remove the weight, and bake for a further 5 minutes. The crust should hold together and be a very pale golden colour. Place the dish on a wire rack to cool completely. 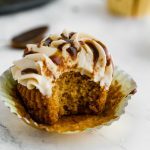 Tip the pumpkin puree, arrowroot powder, salt, and spices into a large bowl and whisk until all the lumps of arrowroot powder disappear. Pour in the cane sugar, maple syrup, cream and whisk to combine. Crack in the eggs and then whisk everything together until smooth. The custard will be quite thick. Cover the bowl with foil or a reusable wrap and place in the fridge to rest for 2-4 hours. This resting time is crucial in developing the strong pumpkin pie flavours; do not skip this step. Once the custard has rested, preheat the oven to 180°C (350°F) and pour the custard into the prepared crust until it is ¾ full. Bake the pie for 50-60 minutes or until the filling looks mostly dry on top and there is a slight wobble to the centre - similar to a cheesecake. The pie will finish baking and become more solid as it cools. If it looks like the crust is browning too much at the 25-minute mark, loosely cover the pie with foil. Allow to cool for at least 1 hour before serving. Top with whipped cream if desired. Both the crust and custard can be made 1 day in advance. Keep the custard refrigerated before baking; the crust can be left out once parbaked. Unless eaten an hour after baking, this pie must be refrigerated for any length of time. You can reheat the pie by placing it in a 180°C oven for 15 minutes. This pie will keep refrigerated and sealed in an airtight container for up to 3 days.